One of the most basic types of analysis that fire department personnel perform is to determine whether they can respond to incidents in a timely fashion. This question leads to several different areas of mapping related to service. FIRESolv Net works with ESRI’s ArcGIS ArcView 10.x to calculate and determine answers to station location and call box area setups. In combination with current digital maps of streets, boundaries, and station and equipment locations, it is able to provide a variety of maps and tables that enable the fire department planner to easily and quickly calculate outputs with mathematical precision. Excel tables display and export run order information. This data can then provide department staff and government officials the accurate information they need to decide whether to realign staff and equipment locations, change hours of operation, or determine where to spend precious capital improvement dollars on new stations or equipment. This program was developed to provide fire department analysts with a geographic way of examining the distribution of records (RMS) and calls (Computer Aided Dispatch – CAD) data within their jurisdiction. Through the use of various report tools and map displays, it also provides needed intelligence to department management and planners. Incident data is quickly and easily added to a database and it can then be queried with simple form-based tools. The output of these queries can then be provided to users as Crystal Reports products (tabular reports, pie charts, graphs). 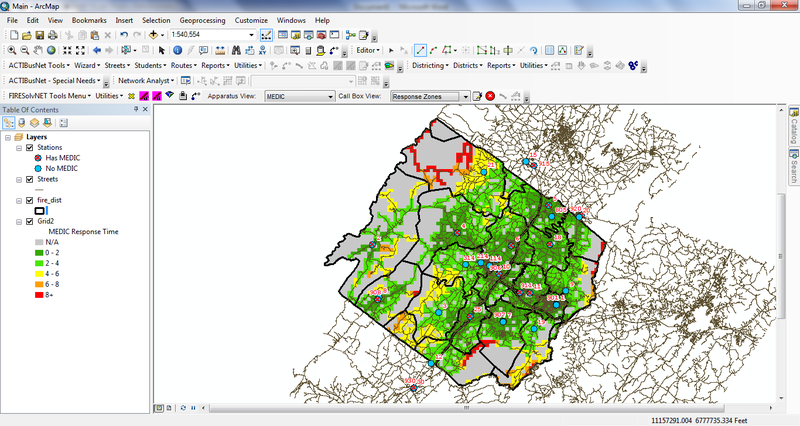 An analyst can simply switch to a map interface and see the distribution of any data selected for display, all against a backdrop of digital GIS (Geographic Information System) map files in their jurisdiction.